Media site for American300 Tours. 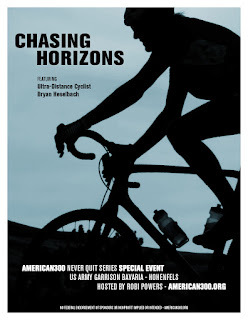 Hohenfels Germany - Chasing Horizons, featuring ultra-distance cyclist Bryan Heselbach of Steamboat Springs, Colorado will be interacting with US Army Garrison Bavaria - Hohenfels soldiers and their family members as Hohenfels Morale Welfare and Recreation along with MWR Outdoor Recreation staff, host a group ride this Friday evening followed by a BBQ and meet and greet with Mr. Heselbach. Mr. Heselbach, is part of American300 a nonprofit that supports the DoD’s resiliency initiatives by bringing mentors to bases worldwide. In the case of Hohenfels, American300 has been visiting the base since 2009. For Bryan Heselbach, the road to representing our country at the World Championships was ‘paved in dirt’, says Powers, pointing out that Bryan, was named to the World Championship Team that competed in Bromont, Quebec Canada in 1992. Not long after the World Championships, Bryan along with his wife Anne moved to Hahn’s Peak Village, a former mining town, 26 miles north of Steamboat Springs, Colorado. It was in Hahn’s Peak Village, working as a construction foreman that he nearly lost his life one day a few years later in the late 90’s, the result of falling off a roof and breaking his body both inside and out. During his lengthy recovery, the question of whether he would work again let alone ever ride a bike again was in question. Through perseverance however, Bryan, slowly recovered, eventually regaining the ability to work and most importantly to his mental well being, his ability to ride a bike. “Cycling has always been part of my life, it’s part of my DNA and on that fateful day back in the 90’s I almost lost it,” recalls Heselbach. After years of gradually getting stronger and stronger, it was time for the now master aged rider to set his sights on something larger, or in Heselbach’s case: longer. Copyright American300.org. Watermark theme. Powered by Blogger.